In the spirit of the New Yorker cartoon caption contest and a previous blog entry by Paul DeWitt…. 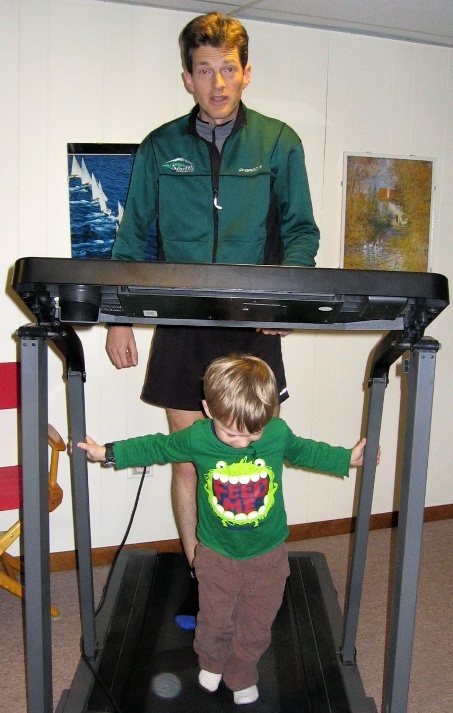 I like this photo (taken by my aunt Beverly) of me and Phil on a treadmill at my parents’ home in Vermont during Thanksgiving break, but I have yet to come up with a witty caption. Readers, what are your ideas? "I can't believe he just peed on the treadmill! And he pretends like nothing happened." Hmmm…. Interesting!My own thoughts were along the lines of:(A) "Man, I was SURE I'd easily win the family treadmill endurance contest…. But the little guy just won't quit! "(B) "What — you think there's a BETTER way to teach him about even pacing?!?"